Scout Alarms is an early stage, pre-product release company, currently headed by a Venture Capital firm/Incubator, Sandox Industries, with no previous experience in physical security. The company intends to name the CEO and management team in the near future. Taking cues from crowdsourced success stories like Lockitron and Twine, Scout booked advanced orders for the systems, with $280,000 USD total. The company is tapping into 'early adopter buzz' that has carried crowd-sourced offerings like Pebble over the top into commercial viability. Base Station: the logical 'head end' panel, this Zigbee hub ties together a system's discrete sensors. One base station is required for each system, and must be connected to an internet connected router. The base station sends alarm notifications to users via WiFi or an optional GSM dialer. Door Panel: In lieu of a central keypad, a combo door contact/RFID reader is placed at each opening. Users arm/disarm the system using mobile device apps and the door panel, which includes a 90 dB annunciator siren. The unit roughly measures 5" x 3" x 0.75"
Motion Sensor: The PIR unit has a claimed coverage range of 20' - 30', and can be mounted in either wall or ceiling mount orientation. The sensors are wireless, battery powered devices with an option of adhesive or fastener mounting. The open/close sensors are powered by standard buttoncell batteries, the Door Panel and Motion Sensors via standard size 9 volt cells. The Motion Sensor includes an option free-standing mount for placement on shelves or countertops. The company indicated that other sensor types, including glass-break, smoke, and CO sensors are being planned for the system. The company's website is taking "Pre-Orders" for custom configured systems ranging between $120 and $360 for the average house. Final pricing varies, due to component mix being customizable according to the user's specification. The company has not released pricing beyond the pre-order period. 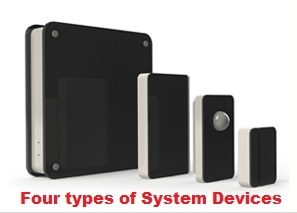 Mobile Managed: Most DIY Intrusion systems use local keypads only or require for-fee add-on hardware and software modules for remote or web management. Fixed Zones/Device Count: With a Zigbee network, Scout's total device count exceeds 256. Most DIY offerings have a fixed number or devices, many supporting less than 32 total. GSM support: Typical DIY options still require a POTS landline for dialer support, IF they even support monitoring. Scout includes an optional GSM component, and does not require token land lines only for alarm use. For additional contrast between Scout and other self-installed alarm offerings, see our "DIY Alarm Kits Surveyed" report. Ease of Install: The system does not require wiring any sensors to the base station, and sensors can be quickly placed using adhesive backing. Even if users move or choose to redeploy sensors, they can be easily removed and restuck where needed. Stylish: Calling existing designs 'clunky beige boxes', Scout offers sensors in a range of finish plate options, include black, white, and wood grain. Scout places a significant marketing emphasis on 'cool factor', saying Scout is a 'sleek' hipster-friendly design. Mobile Integrated: The core of Scout's offering keys on the mass proliferation of mobile smartphones and tablets. The intrusion system is primarily administrated, armed/disarmed, and notifies alarm activity via mobile. Unlike 'traditional' panels, these features are default and free. Self Install/Monitoring: While all intrusion systems technically are 'self monitorible', incumbent alarm companies are reluctant to sell systems without monitoring contracts as it cuts future revenues. When electing to 'self-monitor the full equipment and labor costs must be paid up front, often amounting to thousands of dollars. Scout leverages 'free' installation labor and inexpensive equipment to come in well under typical incumbent alarm system costs. As previously noted, the company has plans for a monitored option, but pricing is expected to fall under 'normal' rates, in part due to no amortized equipment costs being tied into the monthly payment. Battery Cost: A huge drawback of a wireless system is the reliance on battery power. This concern is amplified in Scout's note that "We expect the batteries to last six to 12 months with average use." By industry standards, this time period is much shorter than the typical 12 to 24 month interval most sensors recommend. We asked Scout to clarify this point, to which they responded "Yes, 6-12 months is a conservative estimate on the battery life. We've heard a variety of use cases for how people will be using Scout and we don't want to over-promise." Until testing proves out otherwise, the cost of replacement batteries twice yearly could prove significant. Poor Installation: One of the key 'benefits' also plays a key risk. Alarm sensor placement is not a casual skil, and unless sensor placement is well documented and things like coverage range of the motion sensor are well understood, it is possible that installer error could contribute to false alarms or not triggering when needed. Whether or not they are 'cavemen', professional alarm system installers are trained to know the limits and proper placement of sensors for best effect. Same-ole Sensors: While the product design and stylizing of the sensors are 'hip', they use the same principles for detection that alarm systems have used for decades. There is nothing unique about contact sensors or PIR motion sensors, and despite claims to the contrary, Scout should not expect to deliver results beyond what a typical incumbent system provides. Unmonitored: Again, a key benefit also is a potentially big risk. While a lengthy monitoring contract is frowned on by many, it does deliver vigilant, 3rd party supervision. When used unmonitored, Scout relies on the end user to respond to any alarms or to escalate to authorities if unable. A monitoring service performs these features without needing intervention of the user. A common tactic used by incumbent alarm companies is to 'buy business' by amortizing the cost of equipment over the course of 36 or more months. While a system may cost $99 to initially install, the mandatory monitoring contract can range between $40 and $100 on average for most homes. With Scout, the end user can choose to purchase equipment up front, and pay no additional fees to the company. Scout has yet to formalize details on monitoring services, but expects service to cost around $10 and require an additional GSM connection in the Base Station. A customer can save thousands of dollars over the course of a typical monitoring contract by using Scout. However, as we recently addressed in our "ADT Customer Acquisition Economics" update, it takes an average of 36 months for that large incumbent alarm company to break even on equipment and installation labor. With Scout, the risk is squarely on the DIY-installer and on the equipment build quality to prove a clear advantage to incumbent-installed alarm systems. While the promise is there to be a true cost savings over alternatives after a two or three months, actual system performance must be effective. Since the product has not yet been released, we cannot test performance. "The truth is that, in the first few months following our pre-order campaign, we lost access to resources that were allowing for the ongoing development of Scout. Since we aren’t charging credit cards until we ship the Scout system to you, we had to find a way to replace those resources. We knew that the demand for Scout was high, but replacing the resources we needed to bring Scout to market took time. It took way longer than we had hoped. For that, we truly apologize. "We’re aren’t announcing a new definitive ship date at this time, but are working to get that information ironed out as soon as possible. The delay will be measured in months, not weeks, unfortunately." While anticipation is for Scout is high, this delay could be a big flub in a market teeming with competitive offerings (see: Canary). We will update this post as details and shipping dates become clear. Comments (3) : PRO Members only. Login. or Join.